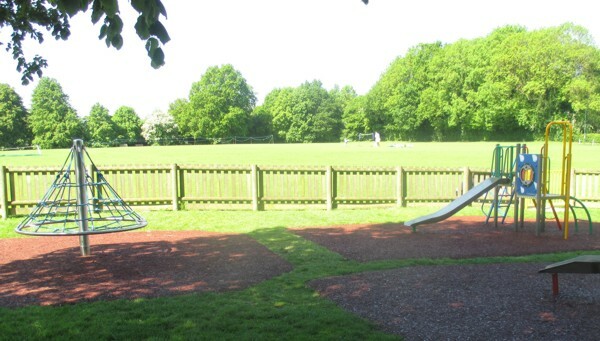 Chevening Parish Council in Sevenoaks Kent were looking to refurbish their existing play area at Chipstead Recreation Ground. They approached seven companies and asked them to quote for ideas to replace the existing equipment to cover the age range of 1-15 years. After a consultation period which included both the local community and local Councillors a unanimous decision was reached to award the contract to Play & Leisure. Councillor Trish Dalton, who organised the process, remarked that it was quite extraordinary that everybody chose the Play & Leisure design with the modified Quest Nemesis unit, with the added traditional slide chute, the stand out piece of equipment, although all the equipment in the design was very popular. Work started in early April with the old equipment being removed and the new pieces installed which included a toddler activity unit, The Avon, from the River Multiplay range, a new set of swings to include both flat and cradle seats and a spinning Cone Climber as well as the modified Quest Nemesis unit. Rubber bonded mulch was the chosen option for the impact absorbing surface which was laid over the existing wet pour. Two self-closing pedestrian gates were also installed in the existing timber fence line, all for a budget of £36,500.00. A Grand Opening Tea Party was held on 9th May, with live music from Ian Fox and tea and cake available from the pavilion. One hundred and fifty parents and excited children attended to celebrate the new play facility and to enjoy a family picnic. Councillor Dalton was delighted with such a large turn out and everybody agreed Play & Leisure had done a wonderful job and provided a play facility that would be enjoyed by local children for years to come. Funding was provided by Chevening Parish Council, Cory Environmental Trust in Britain, Sevenoaks District Council, Big Community Fund, Heart of the Community Award, Waitrose Community Matters and a host of private donations of which the Parish Council were grateful for.